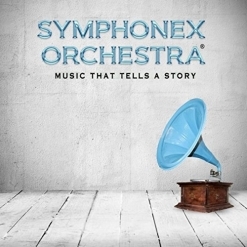 Music That Tells a Story by Symphonex Orchestra is an amazing two-disc set created and produced by Peter Xifaras. It is the first of a planned four-part series, one album to be released each year between now and 2021. Disc 1 includes the six-movement “Dreams in Bloom” plus eight other tracks that are arrangements of classical music and one composition by percussionist Scott Jackson. Disc 2 is the thirteen-part narrated story of “Dreams in Bloom” with that music from Disc 1 added to the narration. The author, The Living Pen, was inspired by the music to write the beautiful love story for “Dreams in Bloom,” which works perfectly with the music. Narrated by Joan Jacobs with her warm and expressive British accent, the words and music touch the heart. The styles of music vary widely from classical songs dating back to the 13th century to contemporary classical to prog rock and beyond. This album definitely won’t fit neatly into any category - my favorite kind of music! Peter Xifaras is joined by six guest artists (including the author and the narrator of the story) who perform vocals (Felicia Farerre), synth (Trammell Starks), drums/percussion (Scott Jackson) and bass (Nic Xifaras); everything else was performed by Xifaras. Disc 1 begins with the six-part “Dreams in Bloom.” “The Encounter” opens with a poignant cello solo with shimmering synth washes behind it. About a minute into the piece, the cello continues with driving percussion, electric guitar, keyboard and additional strings. This one really grabs your attention and holds on, and I defy anyone to sit still while listening to it! “Falling” begins with wind-chimes and then the strings return with a beautiful but sorrowful melody. “Garden By the Sea” has a somewhat Asian flavor with piano, strings, and light bells. “The Letter” is a graceful piano piece accompanied by strings and chimes that overflows with tenderness and love. “The Quest” has a very cinematic quality, expressing mystery and uncertainty. “Reunion” brings the story to a happy close - romantic and contented. “Dinner With Friends” tells the story of the reunion of two friends twenty-five years after they lost touch. Energetic and playful, it’s a delightful interlude between “Dreams in Bloom” and the classical pieces that follow. The next three tracks are “Variations on a Theme of Tromboncino,” originally published in about 1500. Sung in Italian, these haunting contemporary variations include sweeping strings and piano behind the lovely vocals of Felicia Farerre. Two orchestrated “Gymnopedie Variations” are based Erik Satie’s famous solo piano work. I often think of “Three Gymnopedies” as the first new age piano pieces even though they were first published in 1888. Titled “Jaune” (Yellow) and “Blu,” both arrangements are true to the spirit of Satie’s original idea of “furniture music.” The two-part “Hevene Quene”is a modern adaptation of a composition written in the 13th century (composer unknown). The introduction is orchestral with wordless vocals and the main part of the piece has lilting vocals sung in Middle English with strings, percussion and acoustic guitar - a moving closing to Disc 1. Peter Xifaras has created an exciting and fascinating work of musical art with Music That Tells a Story! It is available from Amazon, iTunes and CD Baby. Highly recommended!